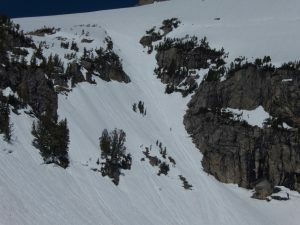 After Drift, I rallied up to the Tetons hoping to do a lap or two on Buck Mountain’s east face, a broad, fun, moderate ski I had done last June. Pulling in after dark, I found that not only was the Moose-Wilson road closed just north of the Death Canyon trailhead, but the road to said trailhead was blocked as well. I suppose I could have walked the road or driven around to another trailhead, but I was feeling lazy and a bit under the weather, so I just slept there, then bummed around Jackson for the day. I have only seen the town during its hellishly crowded tourist season, and found it pleasantly quiet in the narrow window between when Jackson Hole Ski Area closes and Yellowstone opens. Grand Teton is similarly quiet and pleasant — I seem to have finally figured out how to spend the month of May. 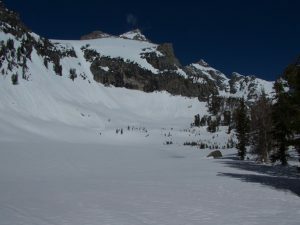 Anyways, I drove up to the Lupine Meadows trailhead to camp, figuring I would ski either South Teton or Teewinot the next day. Some guys I met there suggested accessing Garnet Canyon via the winter route between Braggart and Tadley Lakes, but I stuck to the devil I knew. I also stayed up way too late watching Westworld, so in the end I had a late breakfast and headed for the Spoon Couloir on Disappointment Peak instead. 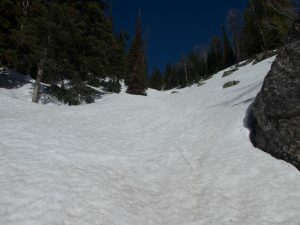 There was intermittent snow on the trail right from the trailhead, but not enough to ski, so I hiked to the Burt Wagon Gulch junction in trail runners, then continued up the lower shortcut a ways before hopping onto the snow in the couloir to its left. I tried skinning at first, but it was too steep, so I put my skis back on my pack and slowly booted up the thing, roasting in a t-shirt in the morning sun. I found myself “racing” two men with snowshoes who were headed in the same direction, and chose the ridge to the right for some reason. My aim was a little off, but close enough, and I soon passed Surprise Lake on the right and Amphitheater on the left, not daring to skin straight across. I saw two men making a very slow descent of the Spoon, and picked up their skin track and bootpack as I neared the base of the couloir. There was a bunch of avalanche debris at the bottom, and a nice runnel in the center, but it didn’t seem to be actively sloughing. The bootpack had been partially covered by slush, probably unleashed when the men skied down, but I still found useful stairs most of the way up. I was still dripping sweat in a t-shirt. 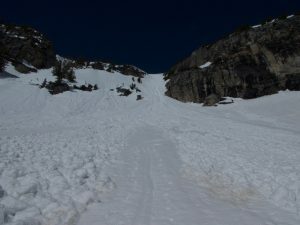 It was late enough in the day that I was concerned about snow conditions, so I skipped the summit and transitioned to downhill mode in a lower-angle spot left of the couloir. I saw no sign of the snowshoers, who had been headed for the standard ledges route left of the Spoon when last I saw them. That looked like a bad idea to me, with multiple small recent wet slides, but who am I to judge? Transition complete, I cautiously dropped into the Spoon. There was still quite a bit of slush hanging around the upper couloir, so I had to ski defensively, making a couple turns, traversing to one side, then waiting for the slush to stop moving. 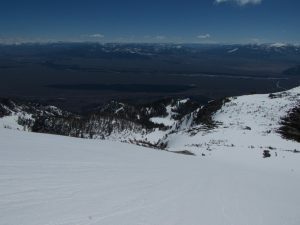 The surface had been better scoured lower down, so I was able to ski more continuously, but I still made frequent stops to rest my thighs, since the sticky slush made for exhausting skiing. The open woods and chute below Surprise Lake were decent, and would have been a lot of fun with better snow. This early in the season, continuous snow extends to within 50 yards of the lowest Garnet Canyon switchback, so I only had to walk from just above the junction. After a warm night, the snow on the trail had been just barely supportive in the morning. On the way back, it was less so, and I had to step carefully to avoid postholing. I returned to the trailhead to see 5-6 cars’ worth of skiers hanging out, who I passed in silence to prepare a pot of glop. 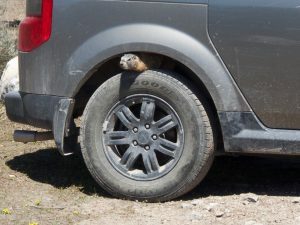 And to chase a marmot out from under my car — I have no idea what he was up to, but I’m sure it was no good. This entry was posted in Skiing, Wyoming. Bookmark the permalink.